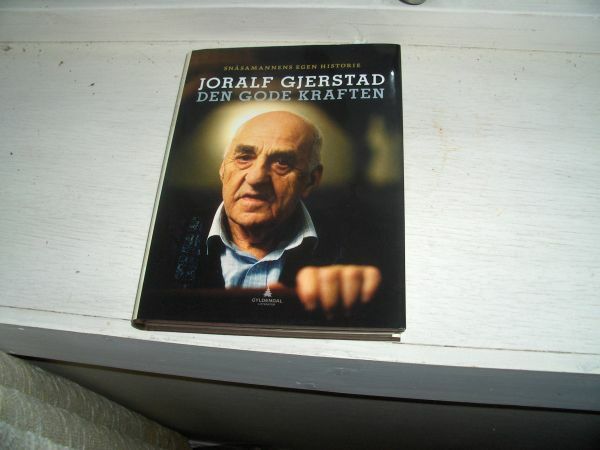 Den Gode Kraften (The Good Force), autobiography by Joralf Gjerstad. Yesterday I received a book in the mail. This is in itself noteworthy, for I do not habitually buy books, especially not physical books. If I do, it is usually because they are of a religious nature and so I expect to read them several times over the years to come. But this book was exceptional in that it was written in Norwegian. I cannot tell how many years it has been since last I bought a Norwegian book. Even in the rare case when I buy a book by a Norwegian author, I usually buy the English translation, since it is considerably cheaper. After all, the total number of Norwegian speakers in the world is less than a single large city in the USA, so economy of scale comes into play. In addition, Norwegians generally have lots of money and are used to paying prices that would shock people from most other nations. So this book, admittedly in hardcover, set me back approximately $60. The book is an autobiography by a Norwegian psychic and healer. Actually, it is his second autobiography. He has always done his psychic readings and healings for free, so I don’t begrudge him if he gets a dollar from the price. I have heard about him occasionally through the last few years, but what caused me to order the book was a newspaper headline where he was said to chastise the Norwegian Princess who offers to teach people (for a price) to communicate with the dead. “SnÃ¥samannen”, as he’s usually called, said this was impossible and dangerous to try. The man says that the power comes from God, the Creator, and not from himself. According to those who know him, he has fed himself and his family through ordinary work for all these years (he is now quite old) while healing and helping people on his free time. He is, from what I can see, a fairly mainstream Christian. So this should be pretty edifying literature, or at least mostly harmless. My work commute is where I do most of my book reading these days. So today I brought the book, and read it for the duration of the trip, approximately 45 min. When I got off the bus, I noticed that my legs were stiff. Actually, my arms were stiff as well, and I felt cold and a little dizzy and sleepy. This continued to varying degrees through the workday. I also had some gut pains, but that is not uncommon. Overall, I have felt half-sick throughout the entire workday and am still not entirely well now that I have come home. Carl Gustaf Jung used the phrase “synchronicity” about “meaningful coincidences”. Â I am looking for a word for the opposite. Not just meaningless coincidences, which many people seem to have lots of, but coincidences that seem opposite to what one would expect. Â Because it is a remarkable coincidence indeed to feel like the onset of a bad flu after 45 minutes of reading about a humble healer belonging to (supposedly) one’s own religion. I did not notice anything in the morning as I got up or when I hurried to the bus. I am not drawing any conclusions from this. Moses specifically forbids taking omens from the things around us, which is what most people use “synchronicity” for. But it is certainly a story I want to write down for the future, if any. This entry was posted in my health, slice of life and tagged books by itlandm. Bookmark the permalink.